1 Missioni di Cuori completate. Per aver inviato 14 Regali. Per aver ricevuto 14 Regali. Per aver Caricato 10920 pixel nel Furni Fuoco d'Artificio. Preparati ! L'avventura ti aspetta in un mondo dove tutto si può buggare ! Vinci il labirinto, in palio soldi, regali, bugs e tantissimi biscotti! 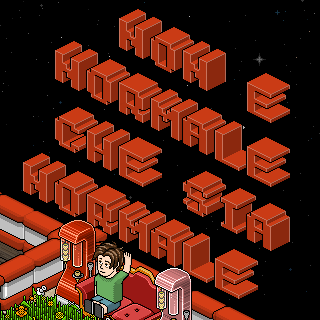 HabbolifeForum.com è un fansite ufficiale di Habbo.it fondato nel 2010 da kaselli. Unisciti a noi e rimani sempre aggiornato sulle ultime novità di Habbo!
" a Meno Che Tu Non Conosca Qualcosa Che Non Possa Essere Venduto e Non Possa Essere Comprato, a Meno Che Tu Non Conosca Qualcosa Che Vada Oltre ad Un Patrimonio Virtule, Non Potrai Mai Conoscere la Vera Vita." Divertiti a sfidare i tuoi amici in gare all'ultimo roller! Prova a completare il labirinto.. e se arriverai alla stanza finale, vincerai 100c ! Cosa aspetti! Qua potrai fare traguardo skateboard , traguardo pattinaggio, traguardo banzai & freeze , traguardo gol , traguardo re delle caselle e molto altro! ‘ Vendo furni introvabili ..
‘ Il giardino che non ho ..
‘ Io da solo ci vivrei ..
‘ C'è acqua su Marte e ..
‘ Perchè piove sempre ..
‘ Dove il sole non tramonta mai ..
Taken in this room on 19 April 2019 and received 0 likes. Taken in this room on 16 April 2019 and received 1 likes. Taken in this room on 15 April 2019 and received 0 likes. Taken in this room on 9 April 2019 and received 1 likes. Taken in this room on 1 April 2019 and received 1 likes. Taken in this room on 23 February 2019 and received 1 likes. Taken in this room on 22 February 2019 and received 0 likes. Taken in this room on 11 February 2019 and received 1 likes. Taken in this room on 7 February 2019 and received 1 likes. Taken in this room on 22 January 2019 and received 4 likes. Taken in this room on 19 January 2019 and received 1 likes. Taken in this room on 25 December 2018 and received 1 likes. Taken in this room on 14 December 2018 and received 5 likes. Taken in this room on 13 December 2018 and received 2 likes. Taken in this room on 3 December 2018 and received 2 likes. Taken in this room on 27 November 2018 and received 3 likes. Taken in this room on 25 November 2018 and received 5 likes.